The application of flexible-pad journal bearings for high-speed rotating machinery has recently gained attention from equipment manufacturers for its simplicity of one-piece design which can eliminate the manufacturing tolerance stack-up and possible lower frictional power loss. 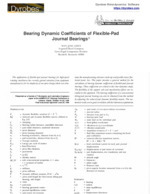 This paper presents a general method for the calculation of bearing dynamic coefficients of flexible-pad journal bearings. These coefficients are critical to the rotor dynamics study. The flexibility of the support web and mass/inertia effects are included in this approach. The bearing coefficients of a conventional tilting-pad journal bearing can also be obtained from this method by adjusting the reduced pad dynamic flexibility matrix. The numerical results are in good correlation with the laboratory experiments.